This report on 'Improved Management of Wet Soils' was prepared in 2002 by Graeme Ward of the former Department of Natural Resources and Environment for the former Dairy Research and Development Corporation (DRDC). 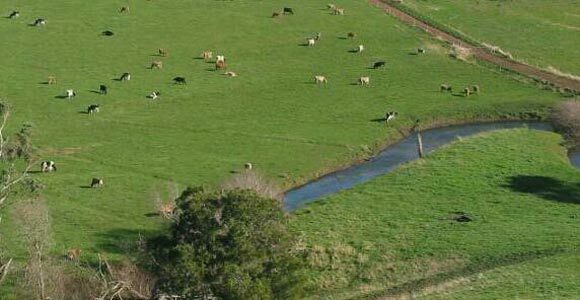 Periodic waterlogging of pastures during the winter-spring period was identified a problem on most dairy farms in southern Victoria in the majority of years. The damage and losses caused when these pastures are grazed was a major concern to the industry, yet the adoption of improved wet soil management strategies had been slow. This project was developed to address a number of issues including developing a better understanding of the adoption of improved wet soil management, providing relevant information on the effect and magnitude of wet soil losses, the effectiveness of different management strategies and the development of new extension material. A market segmentation study on wet soil management was conducted by the University of New England during 1999. This was designed to assess likely reasons for the low adoption rates of improved wet soil management strategies, likely barriers to adoption and to assist in the development of extension strategies. During the first winter of the project (1998), a pilot grazing trial was conducted near Cobden to investigate the effect on pasture of a range of one off pugging severities caused by grazing following a heavy rain event. A series of pugging severity treatments were imposed by varying stocking density at different soil moisture levels and soil strength. A grazing trial to determine the impact of different levels of pugging severity on pasture and soils, and the effectiveness of subsurface drainage and the "on-off" grazing management strategy was conducted at DemoDAIRY, Terang. A soil characterisation study of the major soil types used for dairying in southern Victoria was conducted to assess the potential for surface soil damage by cattle grazing and whether the sub-soils would be suitable for mole drainage. Thirty three sites were examined in south west Victoria and twenty one sites examined in Gippsland. In addition to characterizing these soils, a range of laboratory physical and chemical tests were undertaken. For many of the soils examined tests showed that surface soil damage can occur even before or at field capacity. Mole drainage was found to be a viable option in a range of soils across the south west and Gippsland. The major drawbacks to longetivity of moles were found to be swelling clays and high gravel subsurface (A2) horizons in the south west and sodic sub-soils in Gippsland. The soils were rated and grouped on these different characteristics as they affect wet soil management and treatment. A detailed extension package or module on the management and grazing of wet soils on dairy farms was developed as part of this project.